Could not resist taking this picture: the rams came running up to the fence as soon as they spotted us. 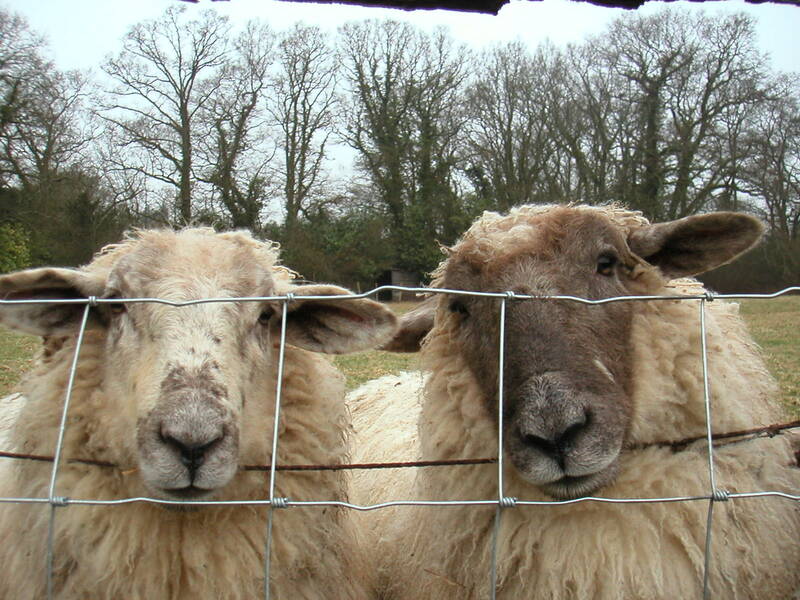 I just wanted to squeeze their woolly faces! Were they friendly or just after food? Is the way to a ram’s heart through its stomach? Anyway, here is a tried + tested recipe for a delicious lamb dish. It would make a great main course for a relaxed Easter supper. …..hope this does not put you off eating lamb. I enjoy eating meat, but never having reared and killed my own animals, I am not sure that I could. Cathy Erway, the author of “The art of eating in” and blog by the same name, describes how she despatches two live lobsters having “sedated” them in the freezer for half an hour beforehand. I love lobster and I know this is hypocritical, but I am not sure I could it kill a live lobster by dropping it in a pot of boiling water. What are your thoughts on killing (your own) animals? Now the recipe, here goes…. Trim the lamb of any obvious surface fat but don’t remove too much and spoil the shape of the fillet. Any remaining fat will melt during cooking and contribute to the flavour of the dish. Heat the oil in a large frying pan, season the lamb pieces with salt and pepper and fry the lamb just long enough for the pieces to brown. Once they are ready, transfer to a baking dish large enough to contain them in one layer. Fry the onion quarters in the same pan for 10-15 minutes until translucent, add the thyme, spices and the garlic for the last couple of minutes. Sprinkle over the flour and stir well for 1 minute. Gradually stir in the stock and bring to the boil. Pour over the lamb, spreading the onions evenly and tucking the cinnamon sticks and thyme sprigs under the lamb pieces. Cover with lemon slices in a single layer and brush with a little of the sauce. Cover the dish with aluminium foil and bake for 2 hours at 190 C.
Remove from the oven, add the olives and return for 15 minutes. If the lemon slices still look a little pale, leave the foil off. Serve with potatoes or boiled rice and a green vegetable, or with warm flat breads and a green salad. Would go down a treat for Easter lunch after an energetic chocolate egg hunt. This entry was posted in real food, Recipes, slow food and tagged cinnamon, Easter lunch, lamb, recipe. Bookmark the permalink. they look so cute those rams….surely you cannot have them for dinner!! if i thought about it too hard i guess i’d have to become a pasty faced vegan!! Maybe not, like my food too much! Look forward to your next recipe.